Curry is honestly my favorite dish. Indubitably. Ranking close to it would be a well-made Greek moussaka or authentic Chile en Nogada from Mexico. I could literally eat these foods in a rotation and gleefully happy the remainder of my days. Perhaps in a future article we will discuss the latter two. Today it is Keto Paleo Coconut Curry with Mussels. Curries are extremely popular in South Asia. They are akin to what pizza is in America though not nearly as healthy and expressive. The two most popular cuisines which feature curry would be Indian and Thai. Fortunately for us, these two types of cuisines have numerous restaurants in most middle-size to large-size cities. The beauty of curry dishes is patent to all who have indulged in it. Curry is warm, perfect for a cold night (though both Thailand and Indian given their semi-tropical climates rarely get cold); it is versatile with its protein, for you can cook pork, meat, seafood all in it; it is widely expressive in its taste. The latter means that various types of curry exist. Green, Red, Yellow are a just a few of the most popular ones. When mixing your choice of meat with any of the various “colored” curries, you can get a wide array of curries bursting at the seam with taste and texture. This Keto Paleo Coconut Curry with Mussels recipe is great. We all love to eat out, especially at Indian restaurants where you might order some warm naan (bread) or spring rolls at a Thai restaurant. But eating out can add up unless you are Elon Musk, so let’s endeavor to make it at home. Let’s start with the protein. We chose mussels, honestly, just to mix it up. Most restaurant curries use chicken, pork, or beef. So let’s go unconventional and opt not for bland shrimp but rather mussels. You can keep the mussels in the shell if you like (or take them out as you see in the pic). Your call! Let’s look at the remainder of the Keto Paleo Coconut Curry with Mussels recipe. Since it is Paleo, you know grass-fed butter and full-fat coconut milk will be used. (For those of you who opt away from dairy milk, check out our Review of non-Dairy Milks article on the Holistic Health News episode. We use coconut-based products for many of the recipes on Naturopathic Earth. The butter and the coconut milk will be loads of healthy and much-needed saturated fat. Plus it will bring taste and satiety to help fill you up. 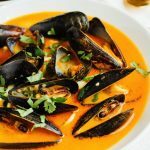 The rest of the Keto Paleo Coconut Curry with Mussels recipe is full of…what else…spices and vegetables! How can you have a curry without it? 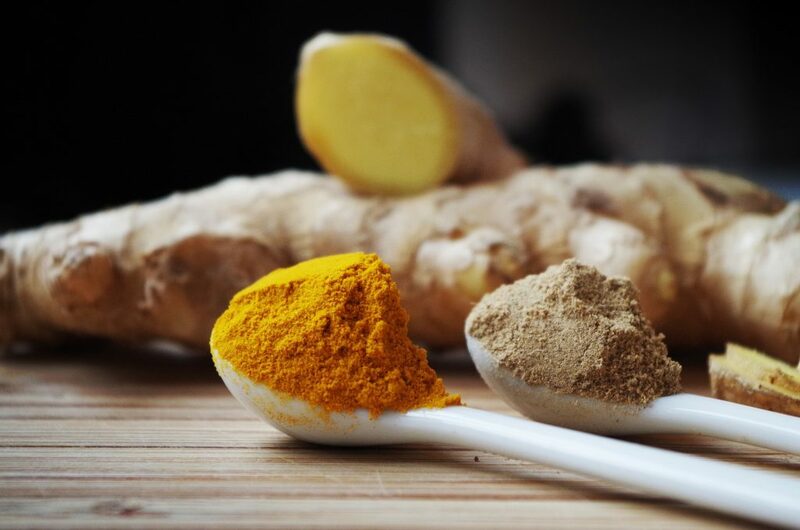 Throw in some incredible ginger (Click HERE to read about the amazing benefits of ginger), onion, salt, and of course curry powder. I personally like to throw in some chia seeds as well for texture, aesthetics, and extra fiber and unsaturated fat. Use the Instant Pot if you like or cook it regularly. Play around with the various spices and curry powder to make it your own. 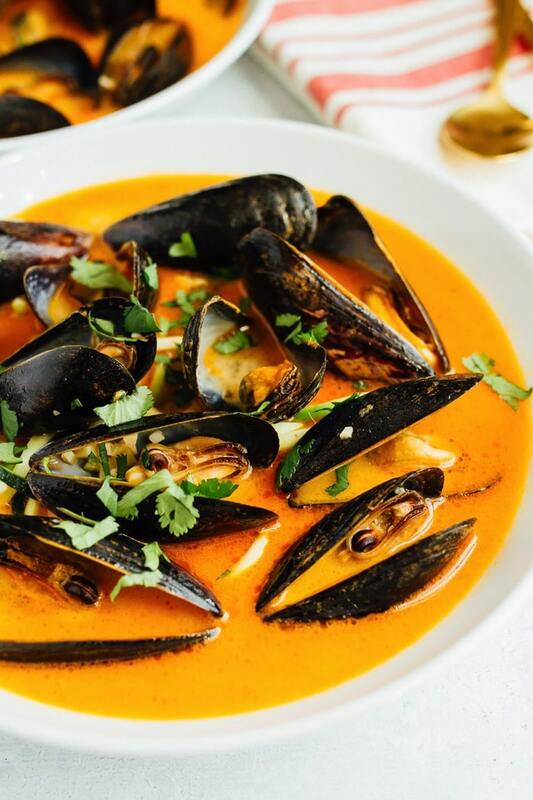 Either way, this Keto Paleo Coconut Curry with Mussels recipe will fill you up with nutrition and expand your taste buds. Purchase this well-recommended curry powder on Amazon now to use for this recipe. Sauté the butter either on a medium-heated pan or in an Instant Pot on the sauté setting. Pour in the full-fat coconut milk, mussels, onion, curry powder, salt, cilantro, ginger, and pepper. For an Instant Pot, close the lid, set the pressure release to Sealing, and choose Manual Cook. Set the Pot to 2 minutes on high pressure and cook. For regular cooking, mix in the ingredients in a pot and cook on medium heat for 10 minutes until well-cooked. For the Pot, after 2-3 minutes, perform the Quick Pressure Release by switching the pressure valve to Venting. Sprinkle in chia seeds. Pour curry into serving bowl. Enjoy! If using fresh mussels, the mussels might separate from the shell. Peruse the pot and remove any shells.